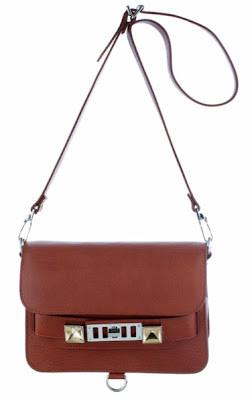 Let me introduce you to my newest crush: Proenza Schouler's PS11 bag. It wasn't until I saw it in another fashion editor's office, perched on her desk, like a piece of art, next to the framed thank you letter from Alexander Wang that I decided I MUST have one of these babies. I love how it manages to be both classic and edgy (with its silver and gold hardware). It's a bag one can wear everyday, anywhere. Shorten the shoulder strap to make it more conservative or elongate it and wear it messenger style. Love. Here it is below, in black. Such an easy bag for all occasions. I like it! Love! I am torn between luggage brown and black. Is black too "heavy" for spring/summer? I think black is seasonless--always chic.